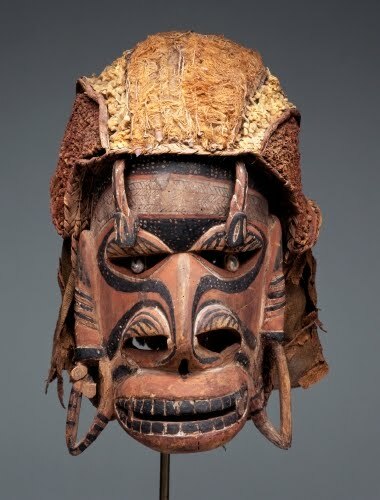 Since I first saw the Rockefeller collection of Oceanic art at the Metropolitan Museum in the early 1990s, I have been enthralled with the sophistication of sculpting, inlay, painted decoration, and combination of materials in their arts. I’m especially fascinated by the variety of art forms involved in the Malagan, the ceremonies held after the burial and mourning of the dead. The masks are especially spectacular. Oceania is a vast expanse of the Pacific Ocean that covers one-third of the earth's surface. Contained in Oceania are the cultural-geographic areas of Australia, Melanesia, Micronesia, and Polynesia. Melanesia includes New Guinea and the islands that extend eastward as far as Fiji and New Caledonia. Archeological evidence exists that suggests the presence of Homo sapiens in New Guinea as long as 40,000 to 50,000 years ago! They most likely crossed over from Indonesia, settling both New Guinea and, by 38,000 years ago, Australia. New Ireland is in the Bismarck Archipelago, located north of New Guinea. Today it is a province of Papua New Guinea. Much of the art produced in New Ireland has traditionally centered on ceremonies and feasts to honor the dead (called Malagan). The Malagan was a ceremony to honor a deceased person or spirits of deceased ancestors. Malagan refers to both the ceremonies that occur after burial, and the masks, figures, and posts made for us in them. Performances, feasts, and dances were organized after the funeral (often one to five years after), when artists were hired to carve masks and complex sculptures that usually incorporated multiple figures. The purpose of the Malagan ceremonies was to help send the soul of the deceased to the realm of the departed, and venerated ancestral spirits. While Malagan sculptures are not portraits of the deceased, they represented the soul, and are thought to have contained the deceased's soul during the ceremony. Malagan sculpture and masks were owned by particular extended families, commissioned especially for the ceremonies by artists who specialized in producing the Malagan. A range of figures, masks, posts, and boards were created. 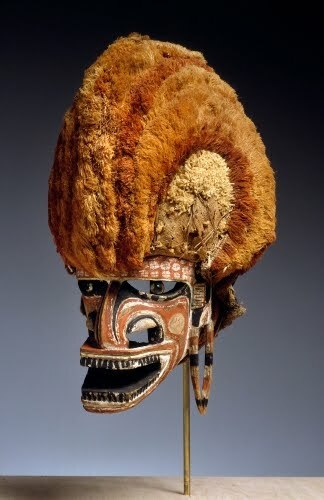 Some were worn during dances, while some were stored in a special Malagan enclosure. There are a variety of masks used for specific purposes during the Malagan. The three above are called tatanua, after the dance for which it is used. 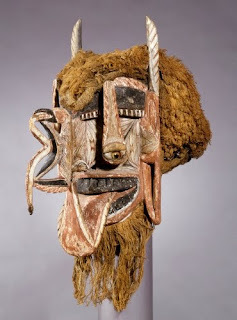 The mask is danced in pairs or in groups of dancers. 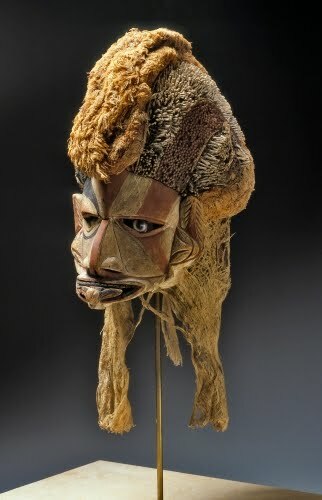 The spirit of the deceased was traditionally thought to enter the mask. It is possible that such masks were "portraits" (stylized) of the ideal male. They were meant to honor the deceased, ward off malevolent intentions, and sever the deceased from possessions in the physical world. The feather part on the crown of the mask imitates the hairstyle worn by young men for Malagan ceremonies, in which the head was partly shaved and the hair stiffened with lime. This mask is called ges. The ges was considered to be a potent, sometimes destructive spirit in the bush. The mask was used during the Malagan to threaten those in the community who did not honor the deceased. The ges mask also helped remove spirits of other deceased persons from the area where the Malagan was being held. 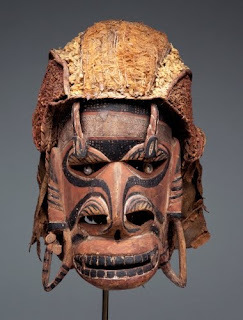 Ges masks particularly rarely survive to find their way into museums because they are so intricately carved into delicate forms from a single piece of wood. This example contains an abstracted nose formed out of a bird head biting a snake. The bird and snake motif is common in Melanesian art, the bird representing the spirit world and the snake the human realm. These two realms are in constant turmoil. The drooping eye reminds me of Picasso’s Cubism! No surprise Picasso was heavily influenced by Oceanic art.